SAUSALITO, CA--(Marketwire - Feb 2, 2012) - Glassdoor, a jobs and career community where people share job and workplace insights, today announced the launch of Inside Connections, a new product that leverages Facebook to help job seekers quickly uncover if they know someone at a company where they want to work. To access Inside Connections, job seekers simply sign in to Glassdoor (www.glassdoor.com) using Facebook Connect to instantly see where they have an "in" at more than 150,000 companies around the globe. For example, if you are interested in working for Google, simply sign in to Glassdoor using Facebook and visit the Google profile page to discover who within your Facebook friend network, including friends of friends, currently works or has worked there. From there, you can browse the deep content Glassdoor maintains about each company, including job listings, anonymous reviews and ratings, salary reports and interview questions and reviews -- all for specific job titles from current and past employees and job candidates. "Who you know can make all the difference in a job search and in your career. By using Glassdoor's Inside Connections, you can now bring together who you know with what you need to know about jobs and companies," said Robert Hohman, co-founder and CEO of Glassdoor. "No other professional network or jobs resource enables users to see this much depth and breadth about companies in one place, while also helping them to identify their own trusted personal connections to the employers that matter most." Tapping into Facebook for job-related connections is important as 4 in 5 employees1 and job seekers2 who use social networks believe it is most helpful to have the career and employer background of their contacts within these networks, according to a recent survey3 of more than 2,000 U.S. adults conducted by Harris Interactive on behalf of Glassdoor. Additionally, another recent survey4 found when it comes to determining whether or not to take a job at a specific company, the majority (52 percent) of U.S. adults who trust opinions of others said they most trust friends and family compared to acquaintances or other people at the company (14 percent). Of the more than 150,000 companies currently represented on Glassdoor, there are 100 percent of the companies that make up the Dow Jones Industrial Average, the Fortune 500 and the S&P 500. NOTE TO WRITERS/PRODUCERS: Graphics and a brief product video are available on request. Please contact pr [at] glassdoor.com for more information. 1 Those employed full-time, part-time, or self-employed. 2 Those who are not employed but looking for work. This survey was conducted online within the United States by Harris Interactive on behalf of Glassdoor from September 19-21, 2011 among 2,291 adults ages 18 and older. This data were weighted to reflect the composition of the general adult population. This online survey is not based on a probability sample and therefore no estimate of theoretical sampling error can be calculated. For complete survey methodology, including weighting variables, please contact pr [at] glassdoor.com. This survey was conducted online within the United States by Harris Interactive on behalf of Glassdoor from January 25-27, 2012 among 2,099 adults ages 18 and older. This online survey is not based on a probability sample and therefore no estimate of theoretical sampling error can be calculated. For complete survey methodology, including weighting variables, please contact pr [at] glassdoor.com. Glassdoor is a free jobs and career community offering an inside look at companies and access to millions of job listings. Glassdoor helps employees, job seekers, employers and recruiters find and share detailed information on more than 150,000 companies, such as Facebook, Google, Chevron, J.Crew, NIKE and PricewaterhouseCoopers. Users have the ability to leverage their Facebook network to uncover Inside Connections at a company and get access to proprietary user-generated content including salary data, company reviews, interview questions and reviews, office photos and CEO approval ratings. 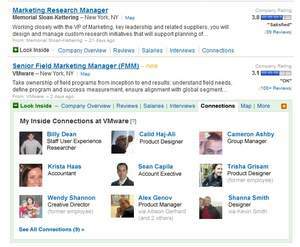 Glassdoor was founded in 2007 and launched its website in 2008. Headquartered in Sausalito, Calif. Glassdoor has raised $22.2 million from its founders, Benchmark Capital, Sutter Hill Ventures and Battery Ventures. More information about Glassdoor can be found on its blog, and by following the company on Facebook, Twitter, Google + and LinkedIn. 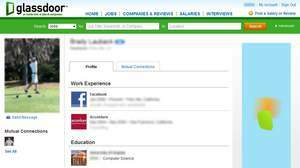 Glassdoor.com is a registered trademark; Inside Connections and JobScope are a trademark of Glassdoor, Inc. Uncover your Inside Connections while searching Glassdoor's more than 6 million job listings. Ready to start uncovering your Inside Connections to benefit your career? Watch this video. Discover where your Facebook friends, plus your friends of friends, work or have recently worked.